One of my favourite bands Mostly Autumn return to the Leamington Assembly on Saturday September 16th for what seems to be coming a regular venue for the band on their yearly tour cycle. 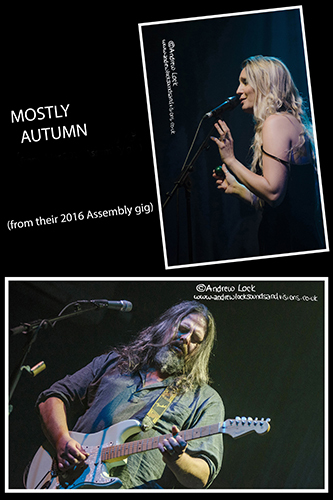 The Assembly show is one of just three dates on the tour to be upgraded to special with a complete performance of the bands fabulous and epic latest album ‘Sight of Day’ as well as another full set of Mostly Autumn classics. If you have already seen them in action I should see you there if not I so highly recommend you give them a go, they have their very own distinctive blend of classic rock with touches of prog an occasional celtic feel and always plenty of emotion. I have seen them many times (the first time was here in Leamington at the Robins Well pub way back in 2002) and I have never been anything but completely entertained at times mesmerised by for me one of the greatest British rock bands around. The photos above are from the bands 2016 visit to The Assembly.